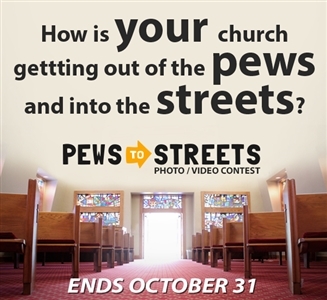 “Pews to Streets,” the Florida Conference’s second Facebook contest, includes both photo and video entries this year, and contestants have just a few more days to enter. Entrants’ photos or videos could win summer camp scholarships for their church youth. The contest ends at 5 p.m. on October 31. Voting will begin on November 1. Videos or photos can be about an international or domestic mission—from rebuilding earthquake-ravaged neighborhoods in Haiti to building a playground here in Florida for neighborhood children who really need a place to play. Click here or go to www.pewsintostreets.com for complete details and contest rules. Photographers and videographers can submit entries through the conference contest app, which is live on the conference's Facebook page (http://www.facebook.com/FloridaUMC). Videographers and photographers 12 and older are eligible. Contestants and the winners must be members of or regularly attend a Florida Conference United Methodist Church. First, second and third place winners will be determined by the number of votes or “likes” for the entry. Address any questions to pewsintostreets@flumc.org.